Commander Shaun Ferguson — who spent much of his 21-year-career in the New Orleans Police Department in leadership roles in Uptown districts — is Mayor LaToya Cantrell’s choice to be the department’s next chief. Ferguson’s career includes numerous periods in the NOPD Second District, which spans from Napoleon Avenue upriver through the Audubon, university, Carrollton, Broadmoor and Hollygrove neighborhoods. As a sergeant, Ferguson supervised the district’s violent-crime investigations after Hurricane Katrina, then left to become a supervisor in the city’s Homicide Division. He then returned Uptown in 2012 as a lieutenant serving as second-in-command to Commander Paul Noel over all investigations in the Second District during a period that saw armed robberies plummet to their lowest number in a decade. 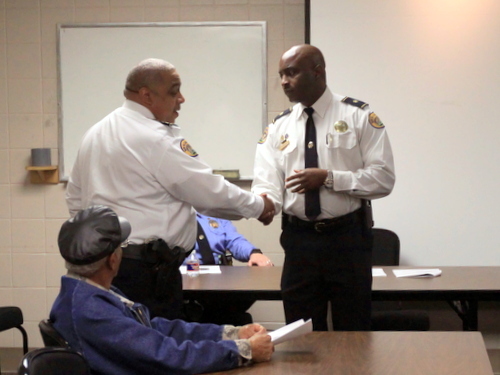 In 2014, Ferguson’s success was acknowledged with a promotion to leadership of his own district, the Westbank-based NOPD Fourth District. In late 2015, however, Ferguson would return to the Second District again, this time as its commander filling the vacancy left by Noel’s promotion to Deputy Chief — speaking to Uptown neighborhood groups on hundreds of occasions, often alongside the area’s city councilwoman, Cantrell. Last summer, Ferguson was promoted yet again to lead the police academy, and on Monday, Cantrell announced that Ferguson will be the department’s next chief, after Superintendent Michael Harrison departs for a job in Baltimore. “I understand how consequential this decision is, and it’s probably the most important decision I will make as mayor of the City of New Orleans, particularly at this time,” Cantrell said in a news release. Ferguson acknowledged his path through so many different leadership roles within the NOPD in thanking Cantrell for the appointment. Ferguson was born in New Orleans, raised in the Lower Ninth Ward and Algiers, and graduated from O. Perry Walker High School in 1990. He joined the NOPD in 1998, and obtained both a bachelor’s degree in business administration and a master’s in criminal justice from Southern University of New Orleans while an officer. Ferguson’s swearing-in on Friday at Gallier Hall will be open to the public, though details have yet to be announced.